Hi, Star Wars. It’s been a long time since I’ve reached out to you like this, so I don’t know if you remember me or not. 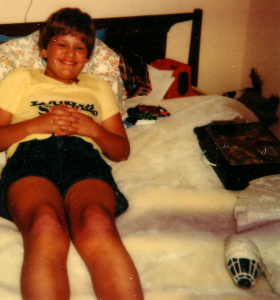 I was that pudgy nine-year old kid who met you back in 1977. The trailers (although back then I just called them “commercials”) scared me a bit because there was this terrifying guy in a black mask that looked like a nasty piece of work, so I wasn’t sure if you and I would get along. My older brother told me I had to see you, so I did. I went back to the theatres another 39 times in the year you were in Richmond. I saw you at Cloverleaf Mall. I saw you at Chesterfield Mall. I saw you at the Ridge Cinemas. I saw you at the Capitol Theatre. The best time, though, was at the Bellwood Drive-In. At the drive-in, I made a great audio recording of the movie (so I could play it in the background while playing with the toys) and I saw previews for this thing called a “sequel,” The Empire Strikes Back. I have memories of my mom dropping me off at an afternoon matinée and Christmas shopping while I sat through two showings back-to-back. I collected the original figures, all twelve of them. (The Jawa was the toughest find.) I sent in the proof-of-purchase seals to Kenner for my free Boba Fett. I got the toys all the way up to Return of the Jedi. (Too many toys to try and collect.) I remember getting you on VHS and watching you over and over. I knew the dialog. I read every issue of Bantha Tracks. And I remember in May 25, 1983 when my dad (completely out-of-the-blue) took me out of school and bought us tickets for your first showing of Return of the Jedi. Some of my best years were spent with you in a galaxy far, far away.